Disclaimer: I received a product from Almondina.com in order to facilitate this honest review on The Eclectic Element. All thoughts and opinions expressed below are 100% mine and mine alone unless otherwise stated. Please do your own research before committing to buy a product or service as your opinions may vary. When it comes to food, we have a love-hate relationship. I big-puffy-heart IT, but sometimes it does not big-puffy-heart me, especially when it comes to some of the nasty reactions I have to some foods in particular. This is exactly why I've tried changing my diet to include more natural and organic items and I really hate to admit it, but I've fallen WAY off the bandwagon and have been eating not so healthy things lately. 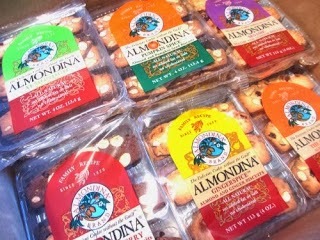 Which leads me to introduce to you Almondina, the all natural indulgently tasty gourmet cookie! "Yuval Zaliouk was a world renown musical conductor and for the past two decades has been the owner of Almondina. 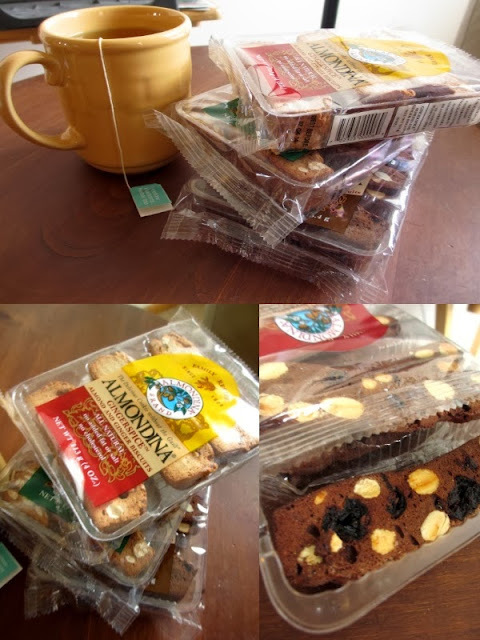 Almondina are unique-a gourmet cookie, health food, and snack, all in one! These extraordinary gourmet treats are created from Yuval Zaliouk's secret family recipe which has been passed down from generation to generation and was first introduced to the market in 1989." Pair with anything from coffee and tea to soft cheeses and fine, light wines, these delicious and healthy crispy and crunchy cookies can be found in stores such as Fairway, Giant Eagle, Whole Foods, Trader Joe's, TJ Maxx, Marshalls and many others around the country! Almondina cookies are known as 'The Delicious Cookie Without the Guilt'; all natural, no cholesterol, and no added fat, salt, or preservatives, kosher and Pareve (non-dairy), and each serving of these cookies consists of 30 grams (4 cookies equals one serving). You can find these cookies in many different flavors; 10 flavors to be exact-Original, Chocolate Cherry, Coconut, Cinnaroma, Gingerspice, AlmonDuo, AnniversaryT, BranTreats, Sesame, Seasonal Pumpkin Spice, with 3 new products in the mix-Chocolate Dipped, Delights-The Original, and Yogurt Dipped! For this particular review I was sent their whole line of gourmet cookies from the Original flavor right down to the Seasonal Pumpkin Spice! It was quite a feat taste testing them all and figuring out which one my favorite was; while the original was a little too plain for me and there was one or two flavors I could live without, I did discover two that I found to leave my taste buds wanting more, one of which was a complete surprise to me. The Gingerspice and the Chocolate Cherry of all things! If you know me, you'll know that I hate anything cherry flavored, so go figure their Chocolate Cherry gourmet cookies would be one of my favorites. What I loved most about these cookies (aside from their all natural healthiness) is the fact they're so versatile! I enjoyed mine with a warm cup of camomile tea, but like the Almondina website boasts, you can enjoy these with wine, cheese, jams and jellies...The sky's the limit! Almondina Cookies that I received! 3. Contest will run from Saturday, December 14th, 2013 to Saturday, December 28th, 2013. That's 2 mandatory entries + 40 possible extra entries which = 42 entries total! I would especially like to try the Chocolate Cherry flavor. Yum! I like pumpkin spice for holidays, would try PUMPKIN SPICE flavor first, it would be great to enjoy with my family . Wow, these look delicious! So perfect for dipping in warm drinks by the fire! I would love to try the ginger spice! I want to try the Coconut cookies. I am a big fan of coconut and these sound great. The chocolate dipped ones sound phenomenal! I would love to try the gingerspice. I'd like to try the Choconut. Those really have a different flavor to them. I did a give-away of the same not that long ago. CHOCOLATE DIPPED would be my favorite one to try because who doesn't love almonds and chocolate! CHOCONUT because it has flavors I love. I would love the chocolate dipped cookies. I would love to try the cinnaroma.. It sounds really yummy. I also like natural and healthy products. I would enjoy all the flavors but especially PUMPKIN SPICE. I love anything pumpkin especially this time of year. These look awesome! Another reason to get on my elptical for sure. I would love to try the chocolate and I would share with my family too. They love cookies! I'd like to try the Choconut variety because they are delicious crunchy & all natural. I would love to win these...I love that they have no cholesterol. I have high cholesterol and am searching for healthy options! The chocolate dipped is my pick. Thank you for the chance to win this they sound delicious , I know My mom would love these Too . I have never been much of a cookie eater By My 87 year old mother Loves Them that is why I am entering this sweepstake, for her. she dose not have a lot of money And can not afford to buy as many cooks as she would like maybe once to twice a year . So Thank you for the chance win this for Her . I'd like to try the Milk Chocolate almondinas! I would love to try the Pumpkin spice I am a pumpkin spice addict! I think everyone at my house would like to try the Choconut. We are all a bunch of chocoholics. I bet they would be great with a cup of coffee, too! mmmm chocolate cherry sunds so good right now!! I would like to try the chocolate dipped almondina because it is good dipped in hot chocolate. Entered as Katherine. I would love to try the chocolate cherry. Who can resist chocolate AND cherry? I love that there are no preservatives and I would like to try Gingerspice. I want to try the PUMPKIN SPICE since it sounds interesting! They have a nice variety of flavors. The 24-pk sampler pack would be the way to go in order to find a favorite. the milk chocolate almondinas... nice and simple! I would like to try gingerspice because I love ginger! I would like to try the Ginger Spice. Yum. I would like to try the Chocolate Cherry flavor. I'd love to try the chocolate dipped one. I want to try the Cinnaroma because I'm a sucker for any treat that has cinnamon in it. Sounds yummy! I would love to try the Chocolate Dipped. It sounds really good and I love chocolate! Would like to try the BRANTREATS. I'm totally a chocoholic, so I'd definitely have to go with the Chocolate Dipped! Or maybe Choconut! Yummy! I would love to try the chocolate cherry flavor. They look yummy! never tried anything by Almondina before so thank you for this review. I would like to try the coconut flavor! I'd love to try the Choconut flavor. I like that the don't have any added fat or salt. I learned the cookies are Kosher and Pareve (non dairy). I would like to try the Chocolate Dipped cookies. Yummy the pumpkin spice sounds good! The Almonduo looks and sounds delicious. I would also love to try the Chocolate dipped Almondina. I would like to try the Pumpkin Spice because I love pumpkin! The cookies are made from Grandma Dina's secret recipe. There are so many delicious flavors, it would be difficult to pick just one! Thanks for the giveaway. The Original dipped in fine chocolate. I'd love to try the cinnaroma flavor. Love pumpkin spice and it certainly suits the season. That said I am always in favor of the chocolate dipped year round. I would like to try the ALMONDUO! I'd love to try the Yogurt Dipped Almondina BranTreats! Thanks for the giveaway… my wife wants to try out the Almondina Tiramisu recipe found on the Almondina blog ! I would love to try the chocolate dipped because chocolate makes everything better!